Swansea City's Kris O'Leary says he knows plenty about the threat the Barnsley strike-force will pose in the League One play-off final. 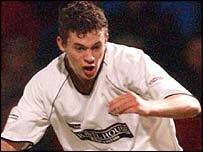 O'Leary played alongside both Daniel Nardiello and Marc Richards when they had separate loan spells at Swansea. Said midfielder O'Leary: "They are quick. Richards was in the team that beat Hull in the final game of the season to stay in the Football League. "And Nardiello's record speaks for itself - he's been at Man Utd." Nardiello spent just a month at the Vetch in November 2003, scoring once in a Football League Trophy defeat against Southend. The 23-year-old then went on to join Barnsley on loan before signing on a free transfer in June last year. "I was there for a month's loan so I know Lee Trundle well and I played with Leon Knight as a youngster with England schoolboys," he said. "In fact I know a lot of their players from my time there so it will be great to play against them. "It's a big day for Barnsley Football Club and we're confident we can go there and win promotion." Barnsley fought back from a one-goal first-leg deficit to beat Huddersfield 3-1 in the away leg. Swansea took four points from the Tykes in their League Two meetings this season, and O'Leary admits he is surprised they reached the final. "Every time we've been up to Huddersfield they've been a really strong side and don't give a lot away," said O'Leary, who has been with Swansea since 1995. "But it's just the way it's gone this season with home teams struggling in the play-offs. "But Barnsley were quite impressive. They're a good athletic side and quick up front."